Buy it, fix it, flip it! Are you a wanna-be flipper looking to get the property, get the job done, and get out—all while maximizing your profit? Not just another house-flipping book, this hands-on guide shows you how to roll up your sleeves and find the perfect property, secure a mortgage, negotiate with condo associations, increase curb appeal, and much more. Flipping a house is more than just buying, updating, and selling. To be successful, you have to be a bit fearless, highly organized, and, at times, creative. 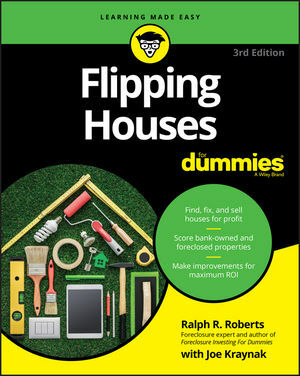 This new edition of Flipping Houses For Dummies gives you practical guidance on the risks and rewards of flipping properties; helps you determine whether you have the time, energy, cash, and other resources to be successful; and then conveys the expert knowledge you need to succeed in a very competitive market. If you're ready for hard work and big profits, start flipping! Ralph R. Roberts is a master at flipping houses, earning a profit even in the deeply depressed real estate market in Metro Detroit, Michigan. He is the award-winning author of several books, including Foreclosure Investing For Dummies. Joe Kraynak is a freelance author and writing consultant who has written and coauthored numerous books on a wide range of topics. He is a valued partner and advisor to many For Dummies authors.